Which is it, the 47% or the 1%? Just asking. [@5:50] Mitt Romney (r): ….three, three rules. Number one, I’m going to look at every program and ask, is this program so essential it’s worth borrowing money from China to pay for it. And if it doesn’t pass that test I’m getting rid of it. So, Obamacare, goodbye, subsidies for Amtrak and for Planned Parenthood, those things, goodbye. Even PBS. I like, look, I like PBS, I gotta be honest, I like PBS, but we, we borrow money so that PBS doesn’t have to show advertising to our kids. Well, Big Bird’s gonna have to get used to Kellogg’s corn flakes ’cause we’re gonna have to have advertising or bigger donations…. Good nutrition? Not likely. The big food corporations will cut ads on PBS and Sesame Street for Chocolate Frosted Sugar Bombs if they get half a chance. 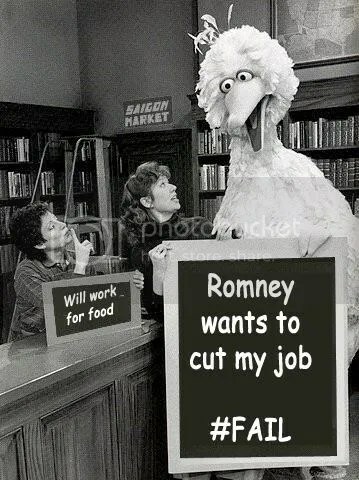 Gee, at the debate Mitt Romney didn’t mention Amtrak or Planned Parenthood in the same breath as Big Bird. Or did he? Must be the Todd Akin (r) thing. Mitt Romney (r): ….What things would I cut from spending? Well, first of all, I will eliminate all programs by this test, if they don’t pass it, is the program so critical it’s worth borrowing money from China to pay for it? And if not, I’ll get rid of it. Obamacare’s on my list. I apologize, Mr. President. I use that term with all respect, by the way. Mitt Romney (r): Good. Okay, good. So I’ll get rid of that. I’m sorry, Jim, I’m going to stop the subsidy to PBS. I’m going to stop other things. I like PBS, I love Big Bird. Actually like you, too. But I’m not going to, I’m not going to keep on spending money on things to borrow money from China to pay for. That’s number one…. Apparently Mitt Romney’s (r) campaign can’t manage the debate expectations game very well. They let slip that Willard has been preparing some debate “zingers”. Twitter denizens have been obliging with suggestions. President Obama: I’m Barack Obama and I approve this message. …says a non-partisan report. You could lose the deduction for your home mortgage, college tuition, health care. How much would you pay? Romney just won’t say. Via Mother Jones, Public Policy Polling (PPP) did a survey [pdf] of 1,072 likely voters in Ohio September 7th through the 9th, 2012. The margin of error is 3%. Some evil genius came up with a question for the poll. The crosstabulations are very interesting. Q15 Who do you think deserves more credit for the killing of Osama bin Laden: Barack Obama or Mitt Romney? That’s interesting. It’s curious that it’s not 27%. Mitt Romney (r) and Paul Ryan (r): Six months ago I couldn’t spell mathematician, now I are one. David Gregory: Give me an example of a loophole that you will close. Mitt Romney (r): Well, I can tell you that people at the high end, high income taxpayers are gonna have fewer deductions and exemptions. Norah O’Donnell: The Tax Policy Center has done an analysis and they say there is no way to pay for the cuts that you’ve proposed without either increasing the deficit or raising taxes on the middle class, because you would have to get rid of deductions and loopholes that benefit the middle class in order to pay for those tax cuts that you’re proposing and that increase in defense spending. Norah O’Donnell: Well there isn’t a Romney plan that’s been specific about [crosstalk] which deductions and loopholes he’s close, would close. George Stephanopoulos: Uh, many say it’s in, it’s difficult to accept your word if you’re not gonna specify which tax loopholes you’re willing to close. Don’t voters have a right to know which loopholes you’re gonna go after? George Stephanopoulos: …not say right now [crosstalk] which loophole you’re willing to close? Paul Ryan (r): Because we want to do this, we want to have this, George, because we want to have this debate in the public. We should do it out in the public view where the public can participate. 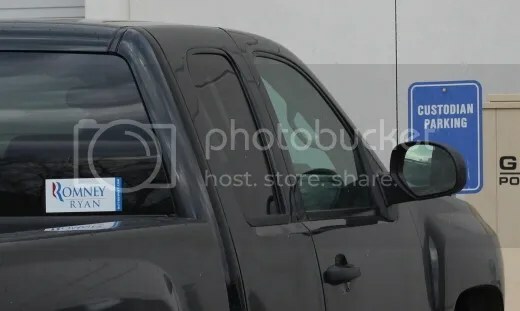 George Stephanopoulos: But that’s exactly what I’m suggesting, having it in public before the election so voters can have that information before the make up their minds. George Will: But there is uncertainty surrounding the Romney Ryan tax cut plan because they have not specified the deductions that will be closed. And we know where the big money is, mortgage interest deductions, charitable deductions, taxing as compensation, which it is, employer provided health insurance, and state and local taxes. All of those you either hit all of the rich, in which case you don’t get much money, or you hit the middle class. And we lose to these people? Apparently Mitt Romney is going to announce on the U.S.S. Wisconsin in Virginia today that Paul Ryan (r), not Joe Lieberman, will be his vice presidential running mate. ….The budget has been prepared by Rep. Paul Ryan, a Wisconsin Republican and the new chairman of the House Budget Committee…. ….The plan would essentially end Medicare, which now pays most of the health-care bills for 48 million elderly and disabled Americans, as a program that directly pays those bills…..
….Conservative activists who are familiar with the Ryan plan said they expect it to call for a fundamental overhaul of the tax system, with a 25% top rate for both individuals and corporations, compared to the current 35% top rate…. ….Most Medicare beneficiaries live on modest incomes and are in no position to pay much more for their health care. The median income of Medicare households is about $25,000 a year, and only about 15 percent of Medicare households have total household incomes over $50,000. Medicare households also spend three times as large a percentage of their budgets on out-of-pocket health expenses – 15 percent compared to 5 percent – as non-Medicare households do. The Ryan budget would significantly raise the out-of-pocket health costs for Medicare beneficiaries with modest incomes, even as it proposes huge new tax cuts for the wealthiest Americans…. End Medicare as we know it and cut taxes for people like Mitt Romney (r). Sounds like a winner. For Obama. Uh, for Ayn Rand true believers the timing for “going Galt” was supposed to be after the November election, not before. ….Vote for Willard & Paul, and believe me, it’s not going to be a problem: you won’t be able to use the words “health”, “care”, and “affordable” in the same sentence ever again.